Aarti is sung while doing fire circumbulation of God and Guru with a lighted lamp. God says "those who worship Me are not my real devotees, but those who worship my devotees are My real devotees". 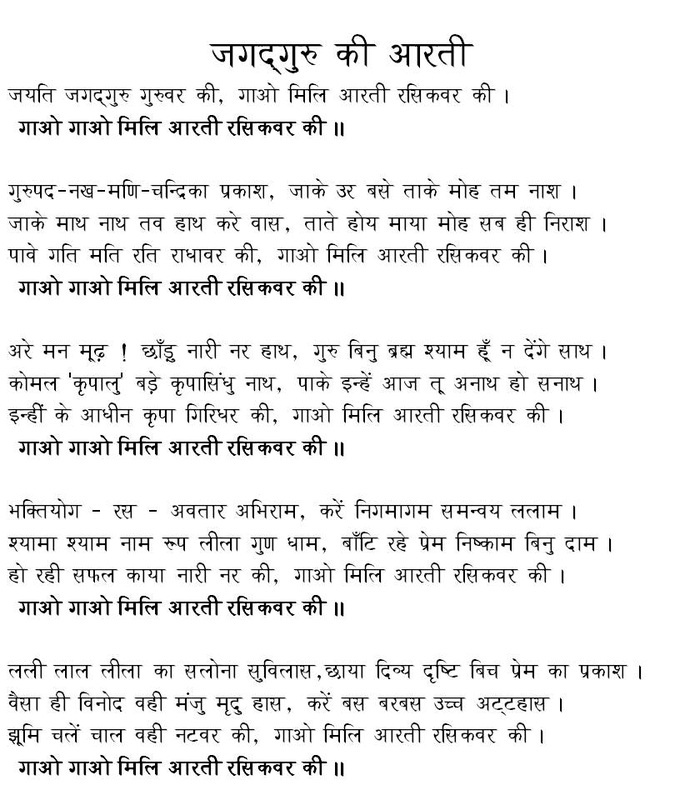 Sing this aarti while humbling yourself before Hari and Guru. Jayati jagata guru guruwar ki, gaao mili arti rasikavara ki. Gaao gaao mili arti rasika vara ki. Jayati jagadguru……. Inheen ke aadheen kripa giridhara ki, gaao mili arti rasika vara ki. Gaao gaao mili arti rasikvara ki. Jayati jagadguru……. Ho rahee safala kaaya naari nara ki, gaao mili arti rasikvara ki. Jhoomi chalen chaal vahee natavara ki, gaao mili arti rasikvara ki. Let us perform the aarti of our revered master- Jagadguru Shri Kripalu Ji Maharaj, who is the crest jewel of rasik saints. The darkness of Maya dissipates immediately from the heart of those who is always surrendered to Him. This is due to the divine light emanating from the nail-gems of His lotus feet. O Lord, The power of Maya, with all its attributes, is incapacitated for those, who are protected by you. Thus, your devotees attain the abode, knowledge and love of beloved of Shri Radha - Krishna. O foolish mind ! forget about banking on the material beings.You can not get the help of even the Supreme Lord Krishna without the grace of Gurudev. You are so lucky to have shelter at the lotus feet of Gurudev Shri Kripalu Ji Maharaj, who is so simple-hearted and the ocean of mercy! Hence, why don’t you take shelter at the lotus feet of such a kind master and put an end to your pitiable condition of being an orphan since eternity? The grace of God is also under His control. Hence, let us perform the aarti of our revered master- Jagadguru Shri Kripalu Ji Maharaj. He is a beautiful incarnation of the nectar of devotion. He is expert as providing impressive reconciliation of the seeming contradictory aspects of the Vedas and other scriptures with surprising ease. He is generously distributing the priceless nectar of the divine names, forms, pastimes, attributes and abodes of Shri Radha Krishna without any cost. Thus, He is rectifying the lives of the human beings. Hence, let us perform the aarti of our revered master- Jagadguru Shri Kripalu Ji Maharaj. His eyes are saturated with the divine light of the beautiful divine pastimes of Shri Radha Krishna. This is the reason why His humorous, luscious way of smiling, fantastically loud laughter and swaying gait are precisely similar to that of naughty Shri Krishna. 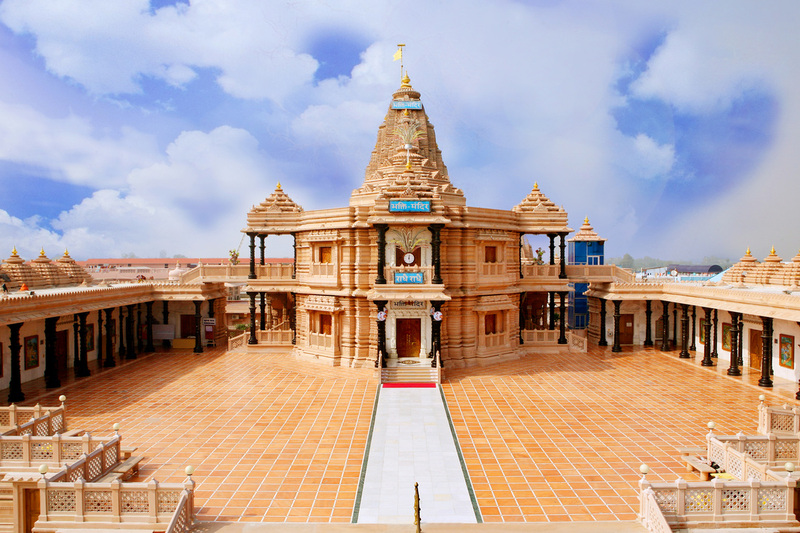 Hence, let us perform the aarti of our revered master- Jagadguru shri Kripalu Ji Maharaj.